A simple resource for use in class questioning. It can be used by history/primary teachers who would like some cross-curricular work. It can be used by Maths teachers demonstrating how and why the number system evolved. 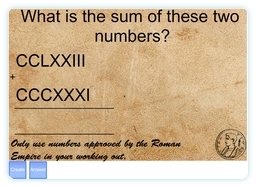 Click on create to generate 2 roman numeral numbers for addition. It would be useful for students to have mini-whiteboards. Encourage them to try and work purely in roman numerals to demonstrate the failings of this system. The students should notice that the lack of place values is quite a hindrance and prevents column addition. Clicking answer brings up the answer and a translation into modern numerals. Note that for consistency the roman numerals generated in this resource use the addition method which is supposedly the one used by early romans. For example 9 would be VIIII rather than IX. Both are methods are equally valid but this resource uses the former. A very good activity for challenging the higher ability kids.